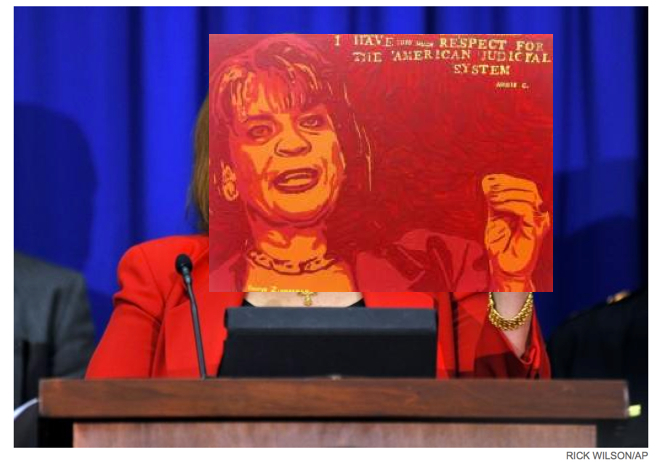 George Zimmerman may face a lawsuit over a painting he created that is drawn from a photograph by Associated Press photographer Rick Wilson – but judging by his response on Twitter, the former neighborhood watch volunteer doesn’t seem too concerned. Angela Corey prosecuted Zimmerman, who shot and killed the unarmed teen on Feb. 26, 2012. According to Wilson’s attorney, John Phillips, the AP sent a cease and desist letter to Zimmerman on Thursday, the day after his brother posted an image of the painting on Twitter. Phillips told CBS News’ Crimesider that his client is sending a second, separate cease and desist letter today. In 2011, artist Shepard Fairey settled a lawsuit with the AP over his use of a photo of then-presidential candidate Barack Obama to create a series of “Hope” posters. In 2012, Fairey was sentenced to two years probation and ordered to pay a $25,000 fine in a criminal contempt case involving his use of the photo.